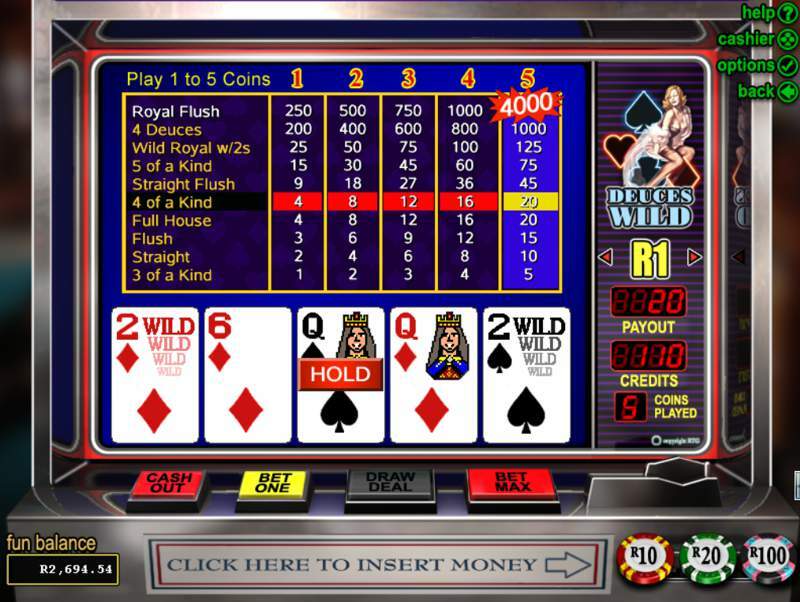 Deuces Wild is a video poker game with one of the best payback percentages, which explains why it’s the second most popular video poker game of them all. Only the original video poker machine, Jacks or Better, has a more significant following. In Deuces Wild, all four 2’s are made wild, meaning they can substitute for any other card to make up hands. These wild 2’s gives Deuces Wild video poker gaming an additional layer of strategy that doesn’t exist in Jacks or Better, which appeals to many of the best video poker players. Another reason Deuces Wild video poker is a favourite is a combination of high paybacks and, in the case of the full pay version of the game, positive expectation. Deuces Wild poker has a higher volatility than Jacks or Better, but that appeals to a lot of gamblers. Deuces Wild plays like your standard version of Jacks or Better, only with a few significant differences. Like most video poker games, one spin is much like a hand of 5-card draw. You’ll be dealt five poker cards by the video poker machine’s random number generator, which is made to simulate all the possibilities in a poker deck. Once you hold your original five cards, you have the choice to discard some, none, or all of the cards. After the redraw has been dealt, you’ll need to build a hand with three-of-a-kind or better to win. The three-of-a-kind only pays off at 1-to-1, so you get a push. You’ll need to get a straight or a flush even to be paid 2-to-1. You might be thinking that’s an awful proposition, but with four wild cards in the 52-card deck, you’ll have better odds than you think. The full pay version of Deuces Wild video poker offers a payout percentage of 100.76%. That’s assuming perfect play, but video poker is a casino game which allows a gambler willing to learn correct strategy to affect the game. Let’s take a look at the numbers, to show what a full pay machine’s pay table looks like. This should be your target when you approach the video poker carousel. Notice the vast difference between getting a Royal Flush with the traditional cards (800 x bet) pays in comparison to the Royal Flush using wildcards (25 x bet). This creates all sorts of video poker strategy questions. Let’s assume you’re dealt the Ace, King, Queen, and Jack of Hearts and all you need is a 10 of Hearts to complete the Royal Flush. Then assume you have a 2 of any suit, which would give you the wild-card royal flush. Would you keep your cards and take the 25 to 1 payout? Or would you discard the deuce and take the long shot at the 800 to 1 payout, with just over a 2% chance to hit the Royal Flush? Next, imagine you only have the Ace, King, and Queen of Hearts, but you also have a 2. Being two steps removed from a natural royal flush, would you dump the 2-card or keep the deuce and hope to hit a wild-card royal flush with 5 of 47 cards in the deck that would improve your hand? Those are the types of strategy decisions players are challenged with when playing Deuces Wild video poker. Studying what computer simulations of these hands lets you learn the perfect strategy so that you can make the right play every time (or almost every time). This game pays out at more than 100% for ideal play (making it the rare “positive expectation” game), but casinos know most people won’t attain that level of mastery. Now let’s look at a game that’s more likely to be found in the casinos you play at the Not-So-Ugly Deuces Wild video poker machine. I wanted to show you the complete pay table for this game because it’s important to show you how hard it is to spot the best game if you walk into a casino not knowing which is which. This game pays out more money on a five of a kind, a straight flush, a full house, and a flush. The only hand it doesn’t pay out as well on is the four of a kind, which goes from 4 to 1 to the better 5 to 1 on full pay. Most people walking into the casino without video poker knowledge are going to see the Not-So-Ugly Deuces Wild and think it’s a better gambling proposition than the Full Pay version. But you know better because you know what to look for. The chances of hitting a four-of-a-kind are much better with four wild cards in the deck, so that bump in the payout schedule makes all the difference in the world. This game has a payout percentage of 99.73%, so it’s still a great game to play if you can’t find the full pay machine. You might find the “not so ugly” designation odd, but it implies this isn’t the best game you’ll find, but it’s still pretty darned good. Playing on this machine gives you a solid expectation of winning (almost 50/50 of what you lose) any given time you sit down at the video poker carousel. You’ll also find a variant which pays out 17-to-1 on a five of a kind, 13-to-1 on a straight flush, the standard 4-to-1 on the four of a kind, 3-to-1 on a full house, and 2-to-1 on a flush. Once again, the bigger numbers at the top of the pay table would make you think it’s the better deal, but this pay table only pays out at 97.08%–a much inferior game to the other two I’ve mentioned. Avoid this game. If you find two Deuces Wild video poker machines in the same casino, I’d suggest you always play the game with the small 5 of a kind and straight flush payouts.